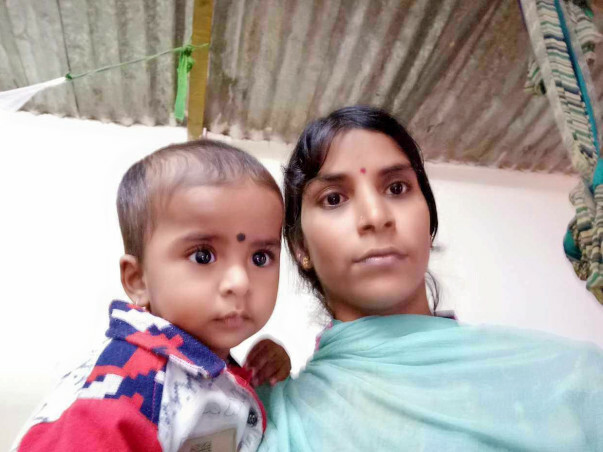 Nanjappa’s 4-month-old baby, Ravi Teja is suffering from an immunodeficiency disorder. His body cannot fight any harmful germ or bacteria, causing him to fall ill very frequently, with almost no chance of recovering on his own. Nanjappa earns only Rs. 300 a day when he can make it to work. Now, he has less than Rs. 5000 a month to fend for his 5 member family. When the doctor explained to him how his 4-month-old baby lived in the constant risk of dying, he was completely broken. Ravi’s mother has not lived a normal life since that day. The parents are very worried, not knowing which slight fever or infection can claim their little one’s life. Baby Ravi’s condition makes him extremely vulnerable. His weak little body cannot fight even the smallest threat. To his parents, all their hopes of a better tomorrow are at stake. The baby can only be saved with an urgent Bone Marrow Transplant. The loving father has been found to be a perfect match for the little one. The procedure would cost the family nearly 35 Lakh.This amount is very big for the poor cook, who only earns enough to afford bare necessities for his family. Unable to run the household, or feed his daughters, Nanjappa is now drowning in debt. Our support will save this baby. It is with a heavy heart that we inform you that Ravi Teja is no longer amongst us. The doctors informed us that there was nothing more they could do. We brought him home and within a week he passed away. Please pray for his soul to rest in peace! Thank you all for the love and support! We are grateful for the generosity shown towards us. Ravi is at home presently and we take him for IV injections to the hospital regularly. 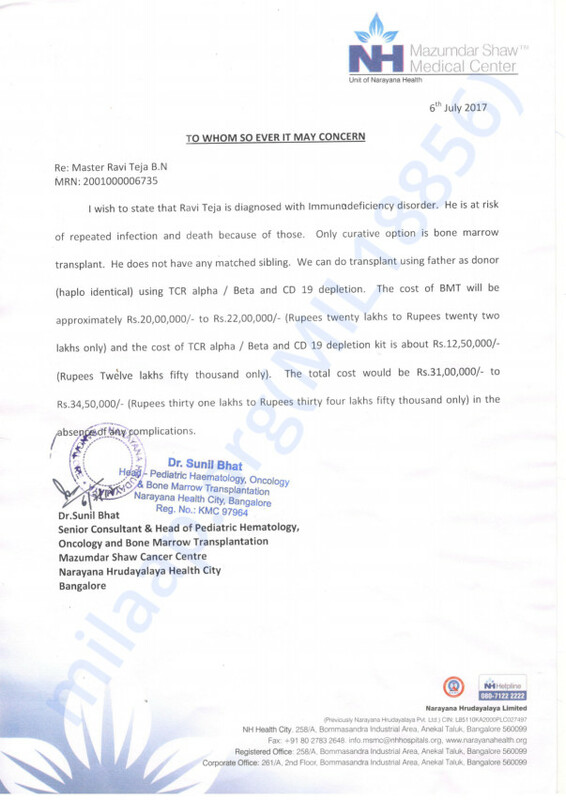 He will require these injections until we are able to go ahead with the bone marrow transplant. He has been given 13 injections so far. He is struggling to maintain balance of his body and his limbs shake due to a lack of control over them. Please continue to support Ravi by sharing this campaign as much as possible with your friends and family! Here is an update on Ravi Teja. He is on continuous maintenance chemotherapy. He will require treatment for another one and a half years. He is doing good.